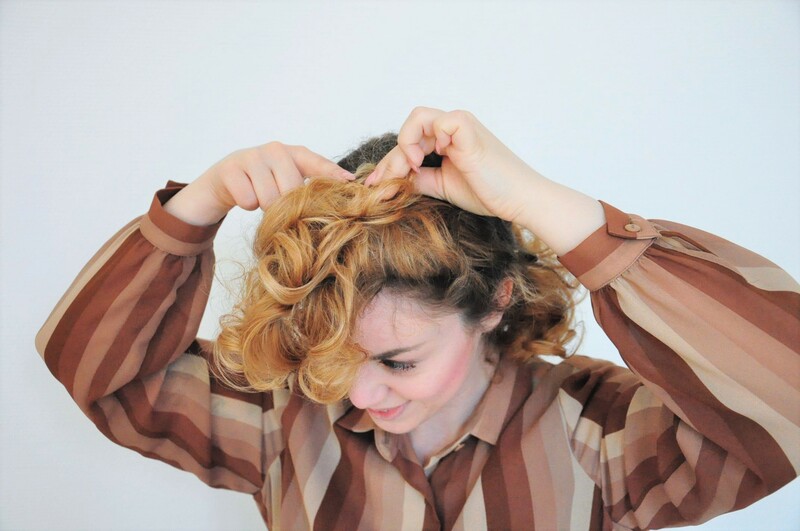 With this easy step by step photo tutorial I am showing you how to create your own curly 1940s hair. Over night, comfortable and authentic. Die deutsche Version findest du hier: Einfache 40er Jahre Frisur. 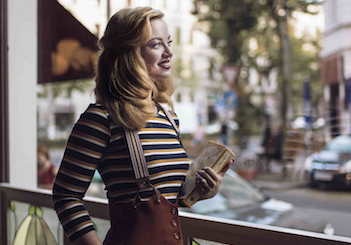 The daily routine of doing vintage hair and makeup becomes second nature – as much as for other ladies creating their „modern“ stylings each morning. Women on the streets ask me whether it takes a lot of time to do my hairstyles, and I always explain that I lay the foundation in the nights, which makes it much easier and quicker. 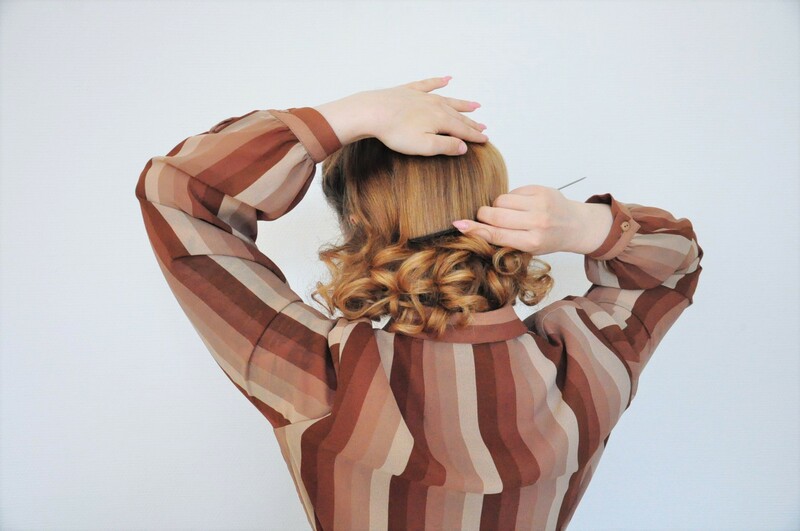 Curling hair over night is a great help and a good basis for various hairstyles, which was already a part of women’s life many centuries back. 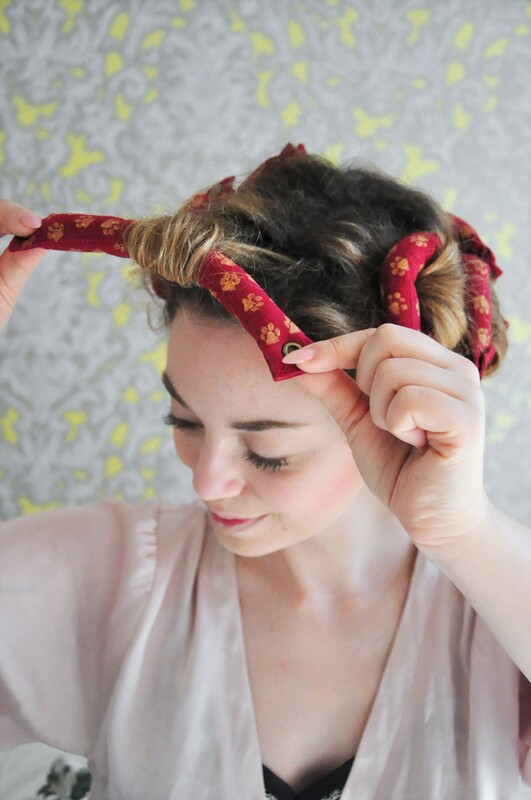 They used strips of cloth to wrap their strands, as you can see for example in those wonderful Jane Austen movies, and later on these were replaced by pin curls. 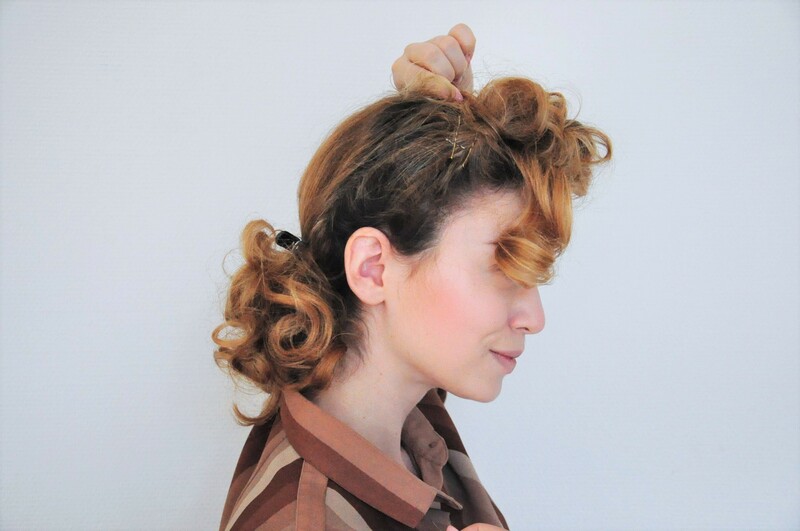 In this post I am going to show you a photo tutorial for curly 1940s hair, which is a basic look that you can combine with lots of garments and accessories, including hats or scarves. 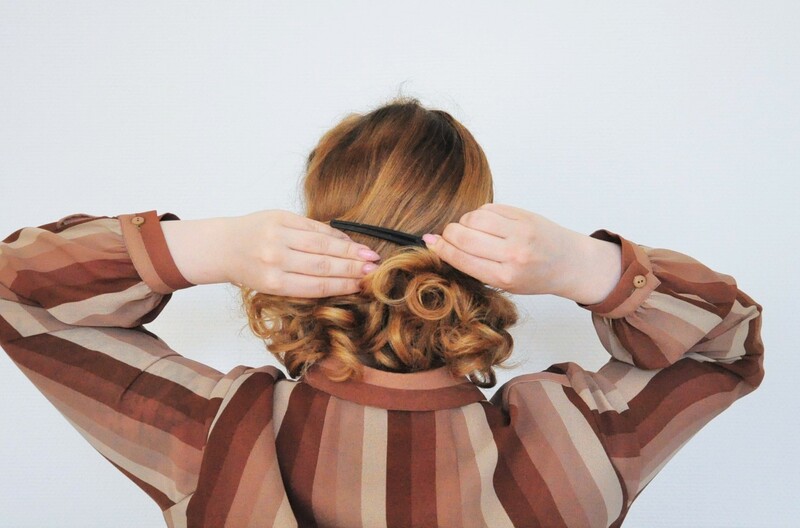 I also like to introduce you to the two ways that I prefer for curling the strands. 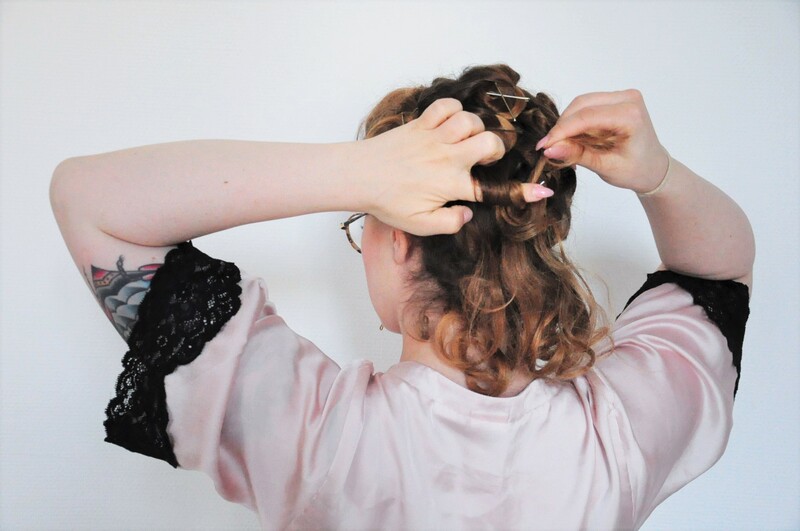 The hairstyle I wear in these pictures is the one that I am going to show you step by step! The photos in Leipzig’s Café Bubu were taken by Sophia Molek. 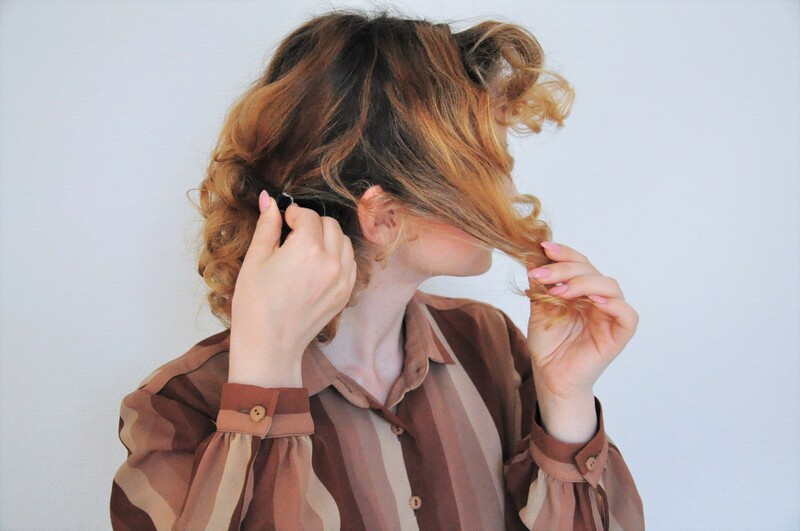 The first way of curling hair is in my opinion the quickest and most comfortable one. 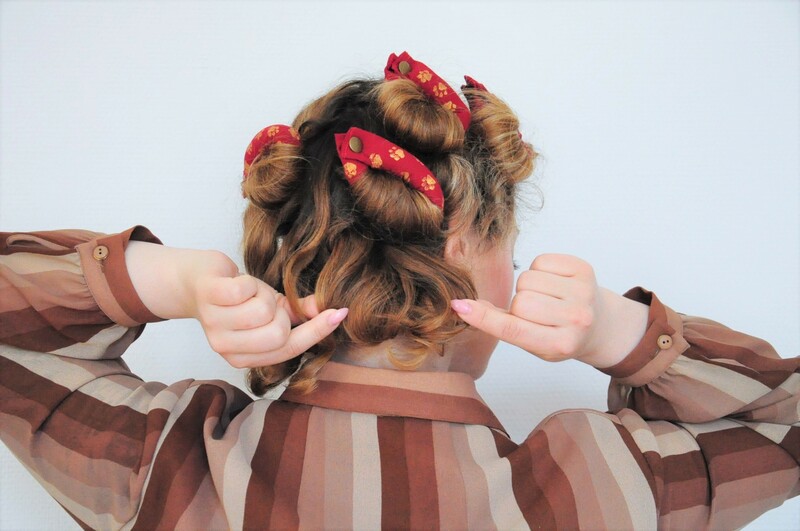 The curls with foam rolls* become a little bigger, compared to using pin curls. I do always use simple hair mousse and kneat it either into freshly washed, slightly wet hair, or into dry hair. Before rolling, comb each strand. Hint: In case your hair is thin or has a straight structure, the curls will last better when you prepare them with wet hair! Use a blowdrier before sleeping, to let it dry a bit and you don’t have to sleep on the entirely wet hair. I do always begin with the top hair, take a strand and roll it – beginning with the end – towards the head. You can clip the ends of the roller together, and voilà. It takes me (with a bit of practice) about 7-10 minutes to finish all my hair. 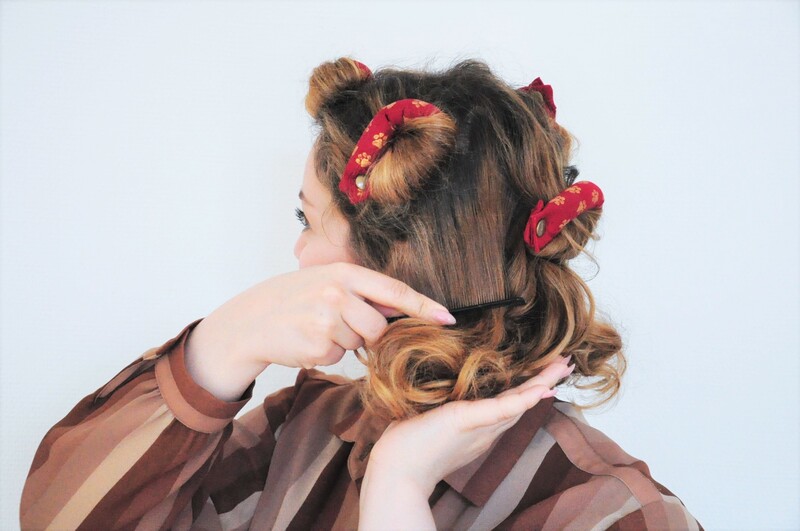 These rollers are quite special for me, as they were created by a wonderful lady, sewer and vintage fashion designer that I worked for a couple of times – Julia Seyfarth*. She sews them all by hand and asked me to design them together with her! We chose a dark red colour with some cute paw prints, (how could I ever choose another pattern than paws as the first design?) which she stamps onto the material one by one. The rolls are very soft, as they are filled with cotton. 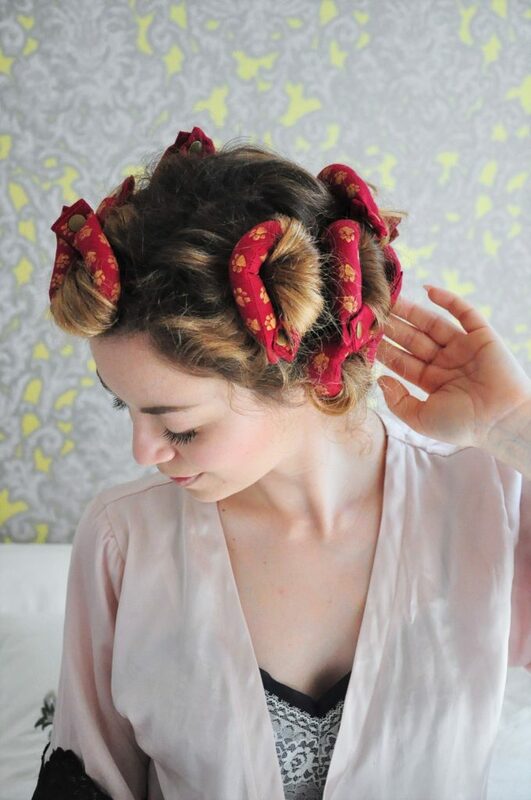 I got used to sleeping on them very quickly, and they are more comfortable than normal curlers. You can find them here in her Etsy shop*. 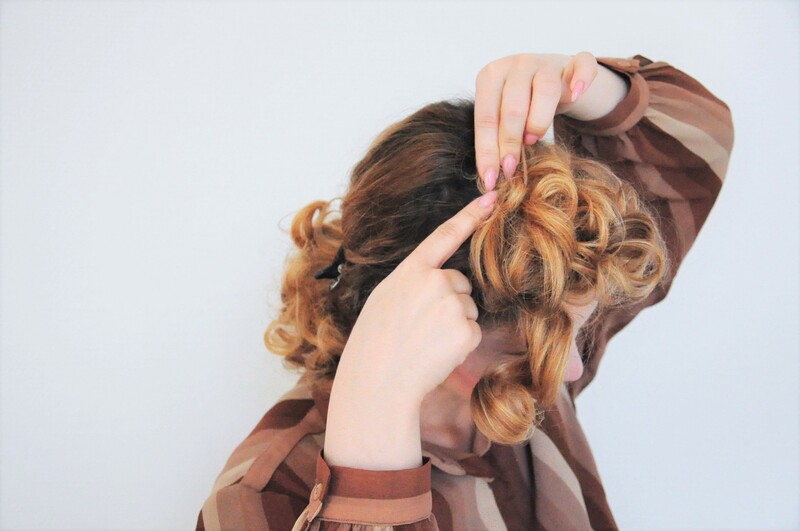 The most common preparation for curly hair are pin curls. 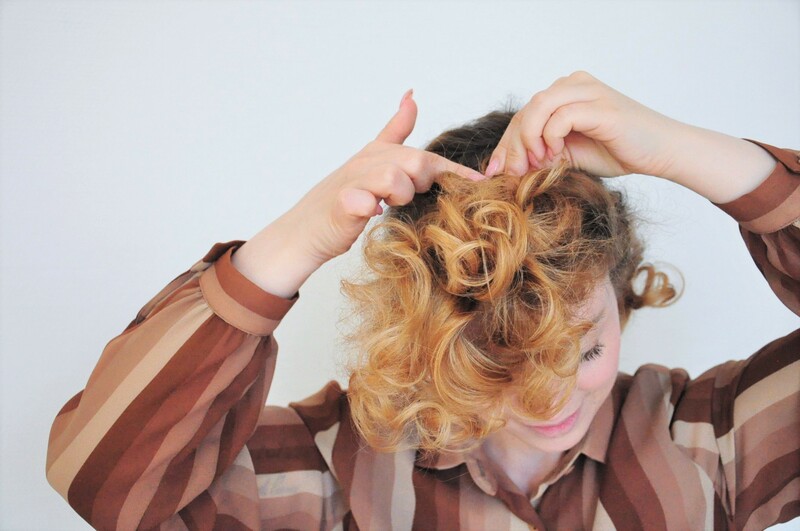 In this variant, I do also prepare my hair with mousse and curl it, either slightly wet after a wash or dry. In comparison to the style above, these curls become a bit smaller. 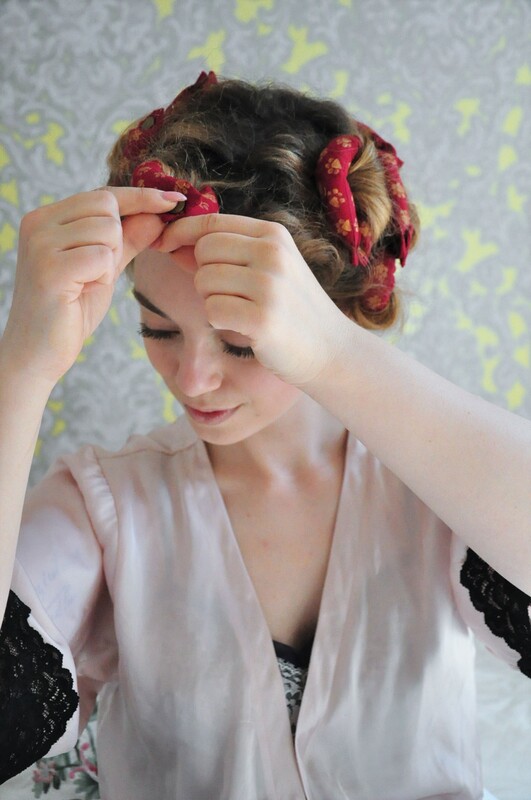 Above you see a wonderful vintage tutorial pin curls. 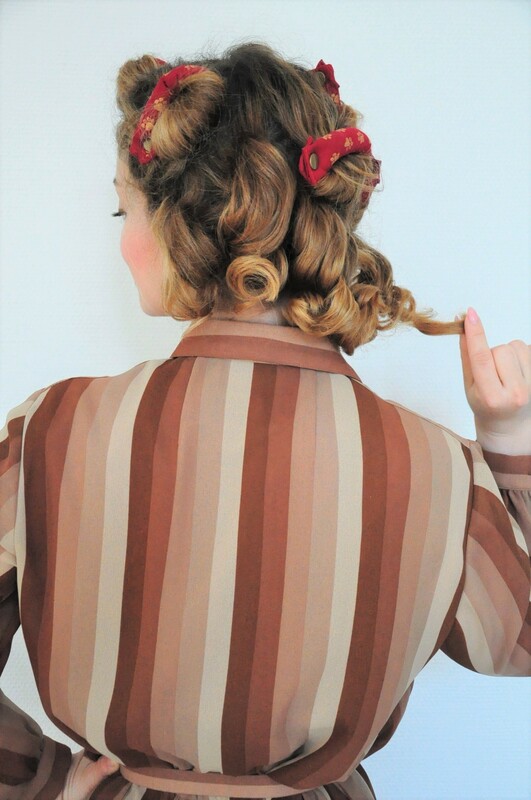 This is a different hairstyle, where only the lower parts of the strands are rolled. I start curling my hair on the top. I take a strand, comb it and curl it over my index finger, to pin it on the head. 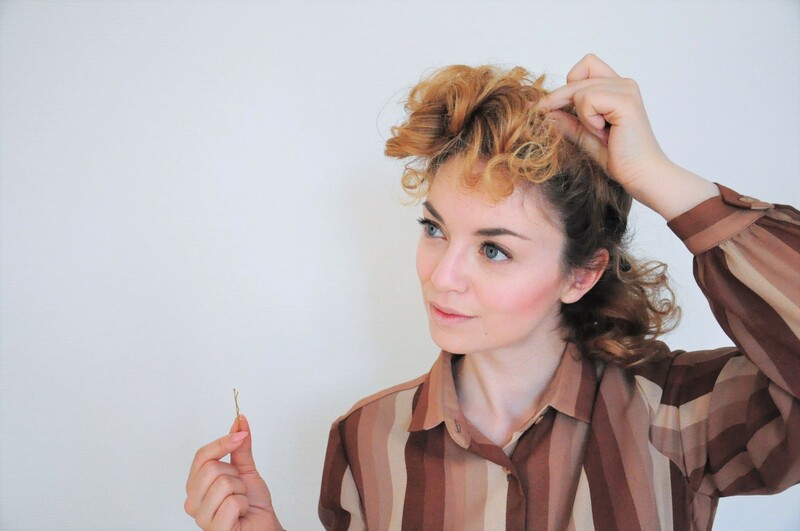 The direction of curling is not significant for the hairstyle later. To make sure it all lasts over night, I use two bobby pins for each strand. 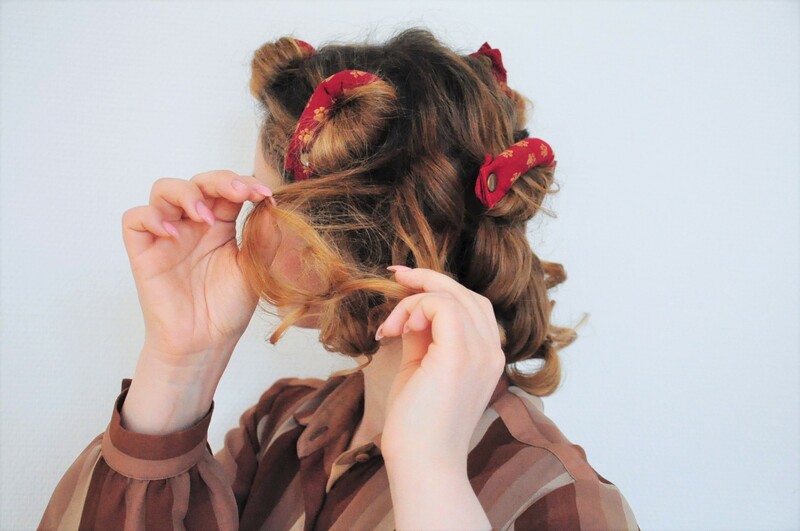 You need to do this all over your hair as well, and if you like, you can also fix it either with a turban or hair net, so the curls won’t open in your sleep. After a long and restful night, you can open your strands in the morning. No matter if you did pin curls or used foam rolls, the steps are all the same! I do start opening the strands with the lower hair. After opening the lower third of the hair, I start carefully pulling apart the strands. This way the curls open up a bit and don’t stick too tight to each other. After this first step, I comb this section from the top to the lower part, ending above the curls as you see below. 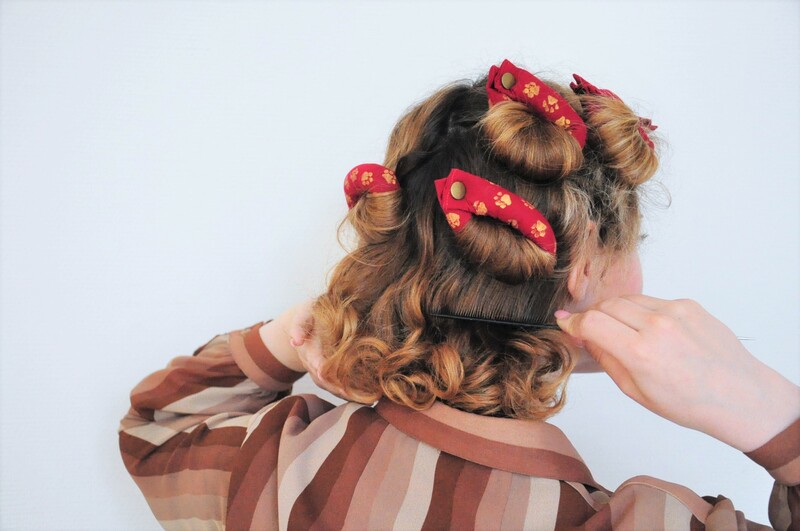 …until the pin curls or rolls are fully opened. 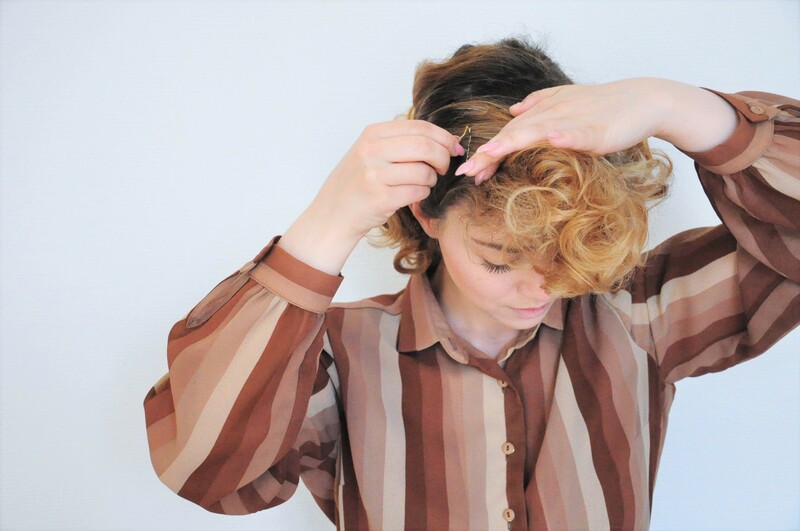 Finally comb the top 2/3 of all of your hair, leaving out the curls in the lower part. 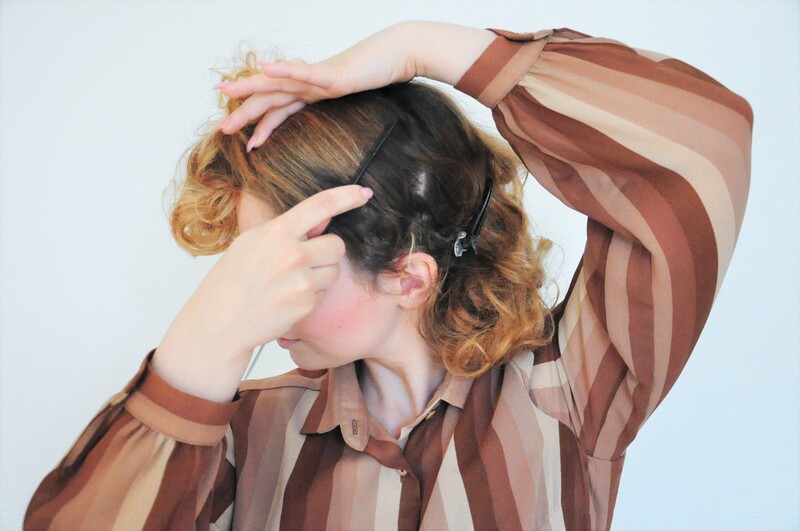 In the next step you need to separate your hair slightly behind the ear on both sides. Pin the rest to the back. On each side, comb the hair via the sides to the forhead and pin it onto the head. Afterwards I start pinning the loose curls to the forehead. I begin with the curls on the back. It is not important to be super accurate, in the end you can still improve the details, and in between it always looks a bit chaotic. Afterwards I use a strand on the side to hide the pins a bit. When you finished pinning your curls to the forehead, open the rest of your hair in the back and do some final combing, leaving out the lower part with the curls again. 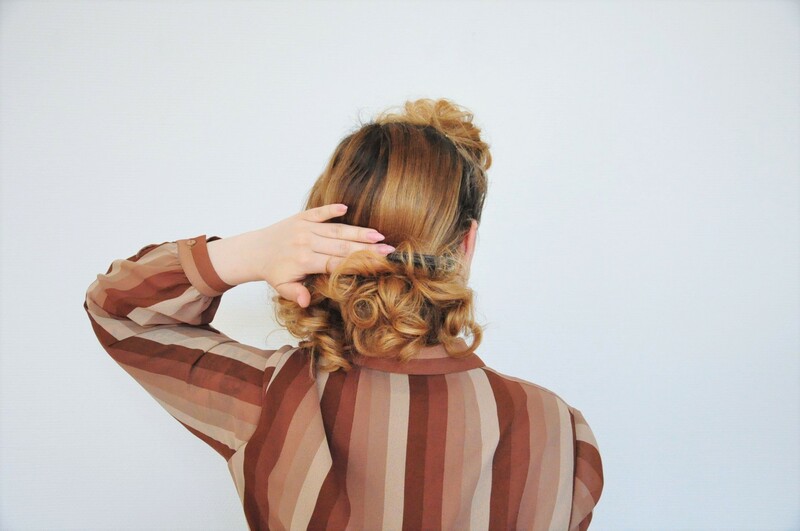 Take some larger pins and fix your hair above the curls. 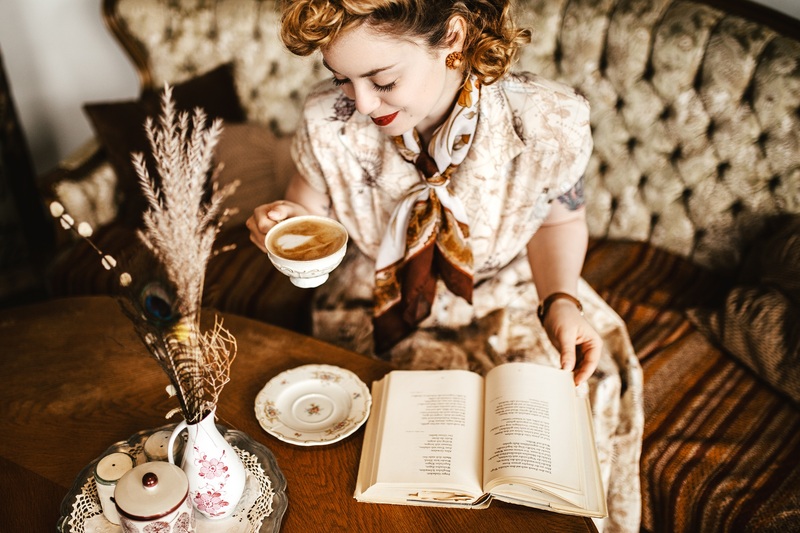 I am a person that is not too perfectionist about hair and make up, so I do not care if there is some bobby pin or a curl not sitting in the right place, that’s simply everyday life! As a final step, use some hairspray to stabilize the hairdo. After it dried, open the large pins in the back again and you are finished! 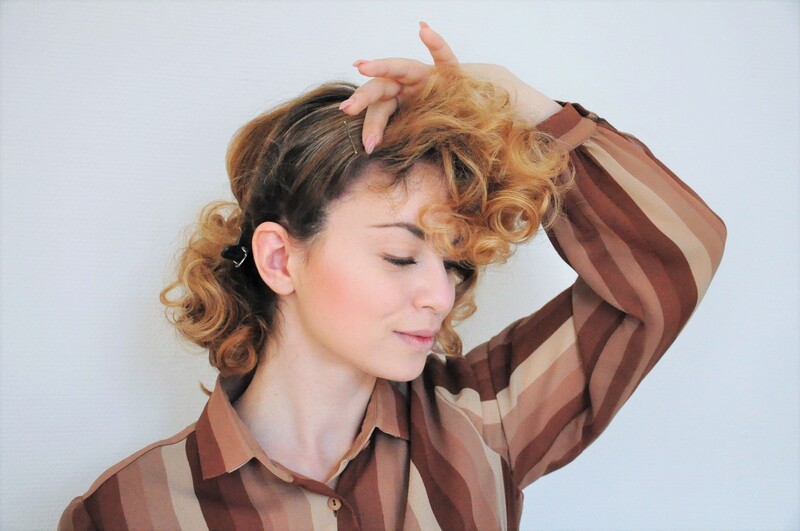 This hairstyle is a look that you can combine with lovely hats that are placed on the back of the head, as the focus of the curls lies on the front and lower part of the hair! 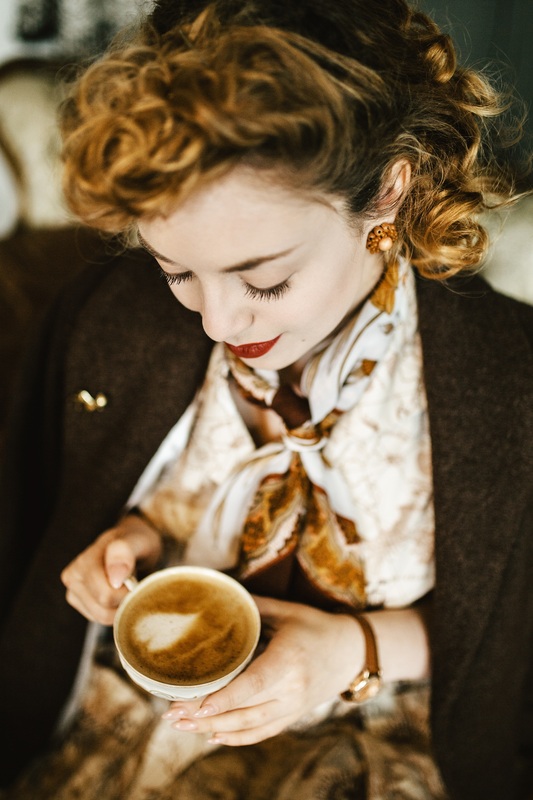 In these photos, that I took together with the wonderful photographer Sophia Molek in Leipzig’s Café Bubu, I wear a simple 1940s look without any hat or headscarf. I added some vintage earrings and red lips – that’s it! 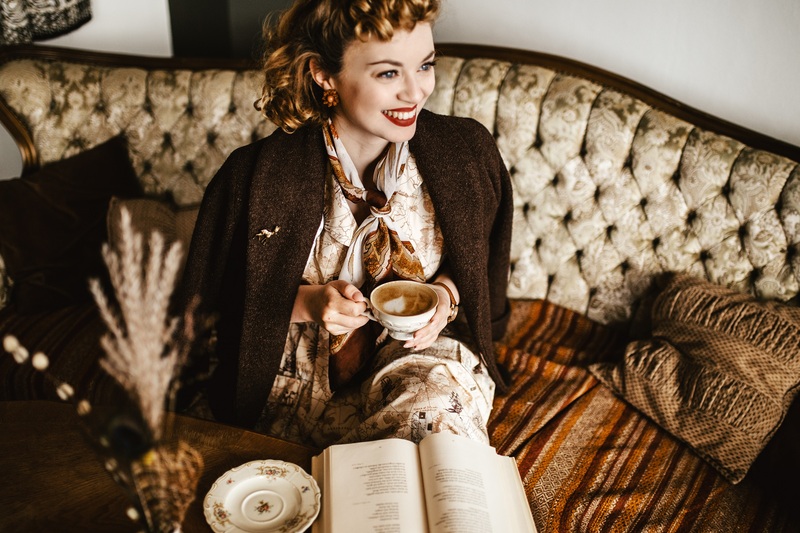 In my post about 1940s fashion you can also find inspiration on what outfits you could team your curls with. 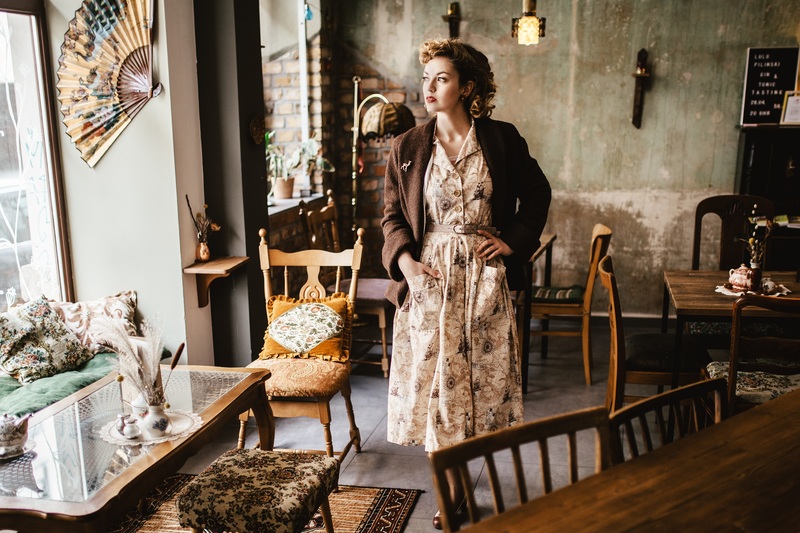 I simply loved the nostalgic atmosphere in the Café Bubu, as well as they had vegan Cappuccino! The wonderful 40s inspired garments were kindly given to me by Vivien of Holloway. 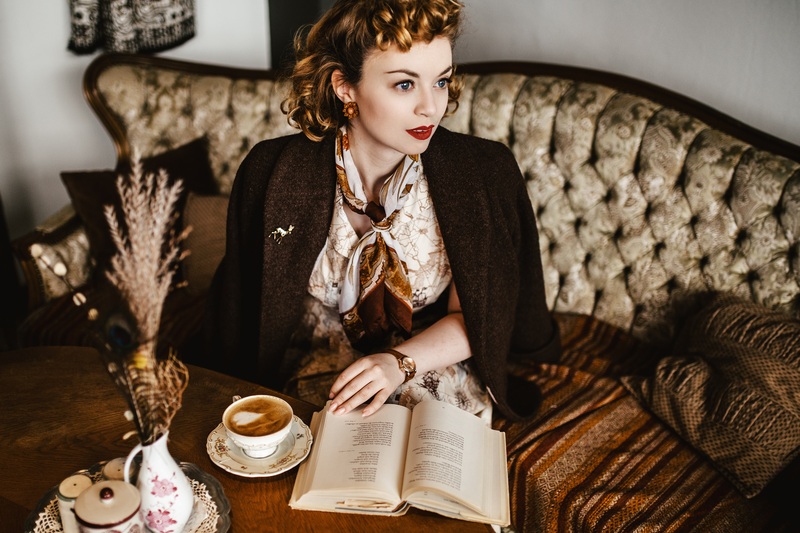 I love the beautiful antique map pattern on the shirt dress, and the wide, straight boucle jacket is definitely a piece to combine with lots of outfits, to add a little boyish flair. 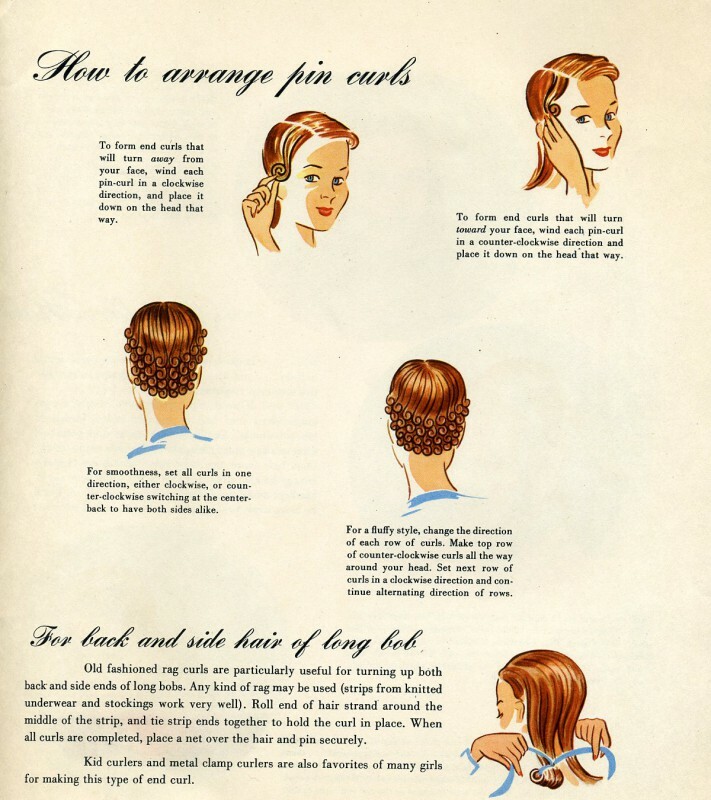 I need to mention that every hair is different in length, strength and structure – so the curly 1940s hair will look differently on every head. So thank you for following my photo tutorial! I would love to hear your opinion and how it worked out for you! 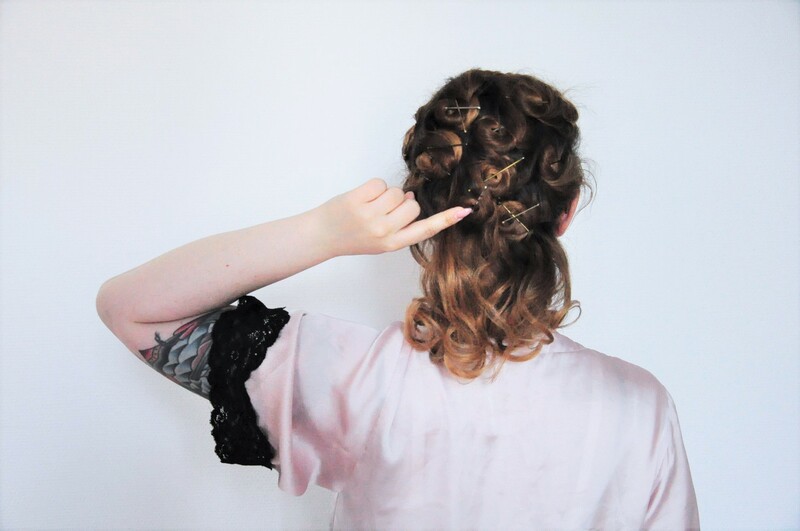 If you would like some more styling inspiration, I finally did start a Youtube channel! I am still practicing a lot, but I would be happy to hear your ideas, wishes and comments! You can find the channel here, my first video is online already.